It’s been pretty busy over at 3ms HQ lately with 3 new albums being released before the end of the year! Let us introduce you to the new bands on our rosta and maybe tempt you into pre-ordering something for yourself of maybe even for…dare we say it…Xmas! Yes it’s fast approaching and there is nothing like the gift of some new music! 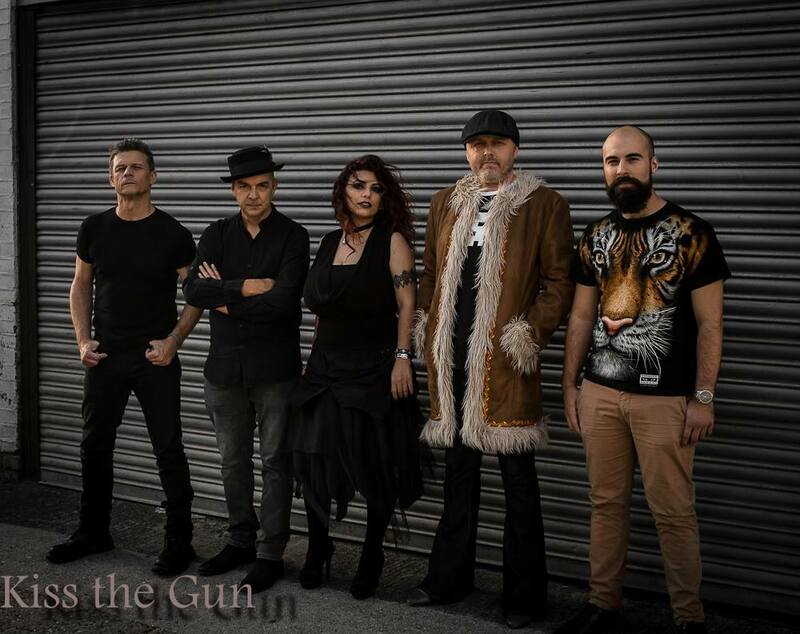 1st up we have – Kiss The Gun – featuring the amazing vocal talents of Nadin Zakharian from Georgia. The band found Nadin on the internet ( as you do!) and she aready has quite a name for herself in Georgia and we can hear why.. what a voice! Singing and gigging with a UK band has caused quite a stir in Georgia and Nadin was recently interviewed in the press. Nadine Zakharyan is a charming and talented singer from Tbilisi. The performer is known in Georgia on the television projects “Talented” and “The Voice of Georgia”. And soon she will become known to the world, as recently the girl officially became a vocalist of the London rock band Kiss The Gun. Nadin Zakharyan told Georgia about her incredible success, about how it all began and about the upcoming concerts with the British collective in England, in an exclusive interview. – Nadine, hello! Firstly, I congratulate you on such a deafening success! Tell me, how did you pass the competition for soloist’s place? – Thank you very much for the congratulations, and thank you for inviting me to the interview! no contest, no applications were made. I was found thanks to YOUTUBE. I created my own channel, where I was uploading covers for world rock hits. Thanks to them, one day the leader of the group Kiss the gun Dave South contacted me and offered a cooperation. – Yes. They were looking for a vocalist for their band. There used to have an old lineup, but they updated it: the drummer, the guitarist, the vocalist. – As you know, this group is quite young. Have you heard of it before? – They were created in 2016. And I did not hear about this band before. – And when you heard, you liked the repertoire? – You know, an interesting kind of repertoire. And I’m open to experiments, I’m all interested. Already had experience of cooperation with other musicians. – With what, for example? – Dave South, the “father” of our band, admitted that it took him a very long time to search, hes used #cover, #female cover hashtags. – Have he searched all over the world? – Of course, YOUTUBE is a well of vocalists from all over the world. I liked the fact that I had a completely different performance than the original. – What kind of cover did he listen first? Did you immediately agree to become their soloist? – Tell us about this album. – The album is called Nightmares, which means “nightmares” in English. The style itself resembles a hard rock of the late 70’s – early 80’s. But I try to bring my own shade into it, because I’m more used to singing metal, and in the sound of these songs, there is a bit of such contrast. There is also a ballad. It was written by guitarist Jerry Hearn and myself. It’s very different from the rest of the album. Each song has a separate meaning: there are songs about love, and about the vampire, about escape, about the musician and his emotions. – How did the work on the album go? – We recorded the album in 5 days. It was very nice. There was absolutely no tension: we joked a lot and recorded the album playfully. – And what will happen next? – We have gigs in October – in London and Southampton. And next year we plan to tour in Europe. – It’s complicated. I can not say anything, although time will tell. – Nadine, how did you get into the world of music? Where did you study vocal? – Did you perform in any groups in Tbilisi? – I wanted to assemble the band, but here it is very difficult. Took part in the TV projects “Talented” in 2011 and “The voice of Georgia” in 2012th. In both cases reached the semi-finals. People still remember me after these years, which makes me surprised and pleased. – And in life do you do anything else? Do you earn by singing? – No, I do not sing anywhere. Unfortunately, I do not earn singing. I’m professionally engaged in make-up. It all started with the fact that I had a deep creative crisis, and I asked myself: what else would I do besides singing? It turned out makeup artistry. I passed professional courses, qualified. Now I work in Art Visage Studio, where we teach students professional visage, take orders for make-up, and also conduct photo shoots in different styles, from commercial to fantasy. – Nadine, you are a vivid example of the fact that if you really want, then you can fly to London. – Seriously, would you advise novice musicians to make more videos in YOUTUBE and not be afraid to show their talent to the world? – Of course! You do not have to sit still, you have to develop all the time, try. And just complain that life is unfair, not worth it. Many of my colleagues’ friends are of the same opinion, do not lose heart and also achieve their success. Everything depends on desire. Look our for further blog posts on Saints of Sin & Scream Serenity coming soon! This entry was posted in Kiss The Gun, Saints of Sin, Scream Serenity and tagged Georgia, KissTheGun SaintsOfSin ScreamSerenity rock music, Nadin Zakharian. Jah Wobble ‘The Usual Suspects’ on Vinyl!